One of the things that I’ve always loved most about Princess Kakyuu is how she serves as such an excellent counterpoint to Princess Serenity — and all in such a subtle way that neither the anime nor manga ever directly calls attention to it. Despite how Japanese the myth of the “bunny of the Moon” our hero may be based on, it’s hard to deny that everything else about the Silver Millennium is about as western as they come. From their style of dress to the castles they live in, you can plainly see that the Moon Kingdom is most definitely not based in Japan. And that’s where Princess Kakyuu and her entourage come in. As western-inspired as Princess Serenity and the Moon Kingdom may be, Princess Kakyuu and Kinmokusei take every bit as much inspiration from the east. So today we’re going to talk about some of those inspirations, and about Princess Kakyuu’s mythological connection to the Moon. I hope you brought your reading glasses, because I’m about to get wordy! I’m not sure how far in-depth I need to go to explain away the western angle of the Silver Millennium since, well, it’s all pretty plain to see the inspiration just on appearance alone. And in a visual medium like anime and manga, I’d say that counts for a lot. But seeing as we’re also talking about a series in which young princesses wore fighting uniforms inspired by 20th century Japanese school uniforms which were in turn inspired by 19th century European navy uniforms,1 I guess I’m willing to grant that “because it looks like it” can be a slippery slope. In that case, the legend of Selene2 — the Greek goddess of the Moon — and Endymion3 — her human lover — should probably be enough to make that western connection stick. So with that background out of the way, what we really want to discuss is where the eastern connection comes in for Princess Kakyuu and her court from planet/star/whatever Kinmokusei. Other than those notes, other parts of her costume are evocative of eastern culture as well. Though I’m a bit out of my element once we get to Chinese history, Princess Kakyuu’s crown comes off to me as very similar to headwear worn by Chinese nobility. It almost looks like something around the Ming dynasty (1368-1644), possibly a much less ornate fengguan hat/crown.7 But that’s just a guess. And since Kakyuu wants to keep with her theme literally from head to toe, we can’t forget about her shoes with their upturned toes. That fashion got its start way back in the Qin dynasty (221-206 BC) and has stayed in the minds and hearts of the fashion forward Chinese for centuries thereafter.8 Apparently it was quite a thing on Kinmokusei as well. 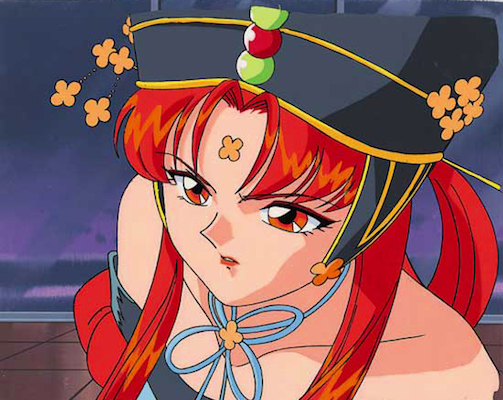 While this may all be a fun little tidbit, the more important question that we’re here to tackle today is that of why she has this eastern theme, and what Princess Kakyuu’s connection is to the Moon. And yes, her having a connection to the Moon is a foregone conclusion. Otherwise I would have titled this article differently. Fortunately for us — and for Ms. Takeuchi as well — mythologies from around the world are absolutely full of stories of gods and goddesses of the Moon. If it weren’t for Japan’s story of a Moon rabbit,9 we’d never even have the Usagi Tsukino we all know and love today. 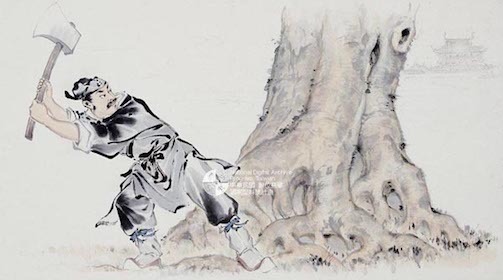 [Wu Gang] is known for endlessly cutting down a self-healing osmanthus tree on the Moon, a divine punishment which has led to his description as the Chinese Sisyphus. While this is fascinating in its own right, long-time readers will have probably picked up where I’m going with this. Kinmokusei (キンモク星 — the star that is definitely not a planet) is a wordplay on Kakyuu’s representative flower of the same name, kinmokusei (金木犀). Otherwise known in English as osmanthus fragrans.11 The very same osmanthus that we just mentioned being on the moon. So much like how Usagi is herself a reference to a Japanese legend surrounding the Moon, so too is Princess Kakyuu, but this time for a Chinese myth meant to explain away the lunar phases. I can’t help but wonder if this also serves as an explanation for why the Starlights came to Earth and created an all-boy band to attract Kakyuu. The Japanese name for Wu Gang is Katsura Otoko (桂男; lit. man of the Japanese Judas trees / “Man in the Moon”),12 though in Japanese slang now this word has come to be used to refer to a hot/attractive man.13 You know, not much unlike a hot boy band. Why did they become a boy band?? I just don’t get it! As for what this all means? Unfortunately, that’s the hardest question of all to answer, because it’s not like we can just knock on Ms. Takeuchi’s door and ask what she was thinking. All we can really do is speculate and theorize. 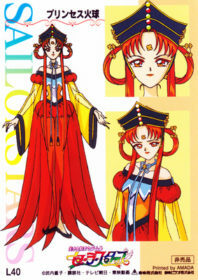 That said, I think it’s pretty obvious that Princess Kakyuu, both in design and origin, was meant to be inspired by traditional Chinese fashion and mythology. The osmanthus connection is just too strong, and all of the little elements of her costume that Ms. Takeuchi pointed out indicate this was intentional. I mean, it’s in her hat, on her forehead, and more. What’s less obvious, though, is whether the legend of Wu Gang (and the related Japanese slang) really does have anything to do with one of the biggest mysteries of Sailor Moon-dom: just what the heck is going on with that whole Three Lights thing?? 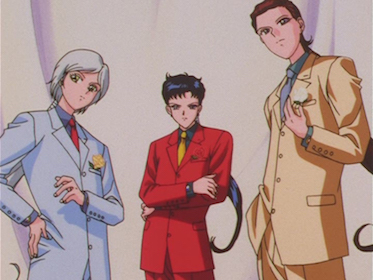 I intend to do some more research on this, which will hopefully turn into an article on its own, but in the mean time, I’d love to hear if you have any theories or questions related to the Sailor Starlights,14 the Three Lights,15 or Kakyuu! Let me know down below. ← Why Does Sailor Moon Use a Kaleidoscope in the Dream Arc? As always awesome article! Starlights and their Princess get a shor stick in fandom recently, so I’m glad you wrote about them too. ^^ I didn’t even thought about Chinese connections. With a Stars Crystal arc still years out (assuming they’ll make it at all) and most of the marketing activities focused either on the Inners or Uranus/Neptune, unfortunately I doubt we’ll really be getting much in the way of Starlights stuff any time soon. x_x Which is pretty unfortunate, since I really like them! SM is currently not on the front, at least not completely. How is Dark Cloud? I bought the game waaaaaaaaaay back in the day, but never got more than 1-2 hours into it. Now that I’ve discovered the Broken Dagger Glitch it makes it a bit easier to level up weapons, as a kid I didn’t get headaches as often as I do now so it makes it less time for me staring at the tv, glasses or not it’s the same now a days, still it’s fun to play glitch dagger or not. NowI’m wondering how can Sailor Moon and the others gain wings like that of Angels? ?